Finishing Consultants are experts in all of the industry leading spray guns for any application. 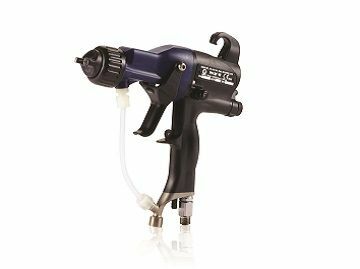 Whether you are looking for a simple, easy to use straight out of the box spray gun, or to solve a complex problem with your finishing operation and product, Finishing Consultants can help build you an effective spraying solution. Our consultants are trained to work with you to determine the best spray gun for your process, application, and budget. The spray gun industry can be quite complicated, with many products on the market offering a multitude of promises. At Finishing Consultants, we strive to work for you in order to develop the best solution for your unique situation. The spray guns offered by Finishing Consultants are industry leaders in reliability, transfer efficiency, finishing quality, and pattern control, as well as operator efficiency and ease of use. Finishing Consultants staff are factory-trained specialists and product experts. Finishing Consultants also offers a vast range of other spray gun equipment such as spray systems, spray booths, and spray equipment accessories. 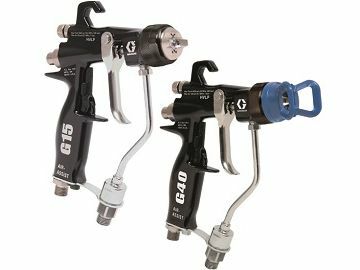 Whether you are on the market for a replacement spray gun, or for a plural component spray system, Finishing Consultants can help you with all your spray equipment needs. We offer consultation services to help you develop a complete finishing system for your specific industrial, commercial, or manufacturing application. Schedule a visit today and we can walk you through some options. All spray guns work in a similar manner. A coating material such as paint or powder is transferred from a container such as a gravity fed hopper or box via a hose to a paint gun. From there, the fluid or powder undergoes a process called atomization, whereby the material is mixed with air, creating tiny droplets that are forced through the spray gun nozzle. Although spray guns operate on a fairly simple principle, there are nonetheless a wide variety of spray guns available depending on a number of factors including the material being sprayed, the fluid or powder used in coating, fluid viscosity, fluid flow, available air, the type of production line & production rate, and many other variables. Different coating materials require different air pressures, different nozzle types, and different types of fluid handling. Additionally, the surface you are finishing has specific requirements as well depending on the desired finish. 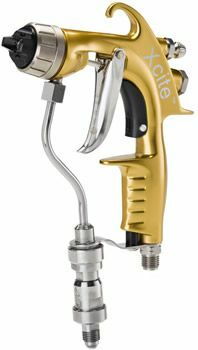 Spray guns are utilized for a variety of finishes, and there are specific spray guns and accessories for each application. Finishing Consultants are experts in spray finishing, and we will help you determine the best spray gun for your specific application and production process.